Today’s post is a guest post by Tony Hoffman. He’s a fellow Planet Hunter and is also one of our Planet Hunters Talk moderators. Today he’s writing about the public talk Planet Hunters PI Debra Fischer gave at the Amateur Astronomers Association of New York. 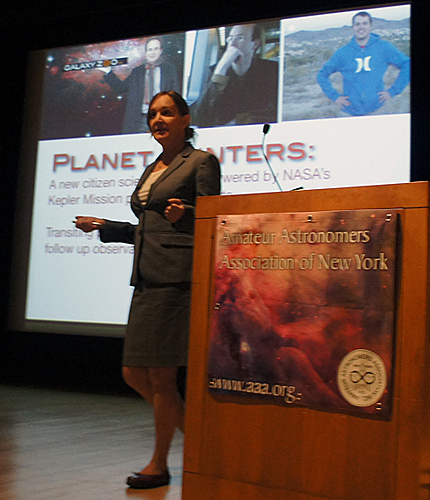 On March 30, Planet Hunters’ own Debra Fischer, professor of astronomy at Yale University, gave a talk on “Searching for Earthlike Worlds” for my astronomy club, the Amateur Astronomers Association of New York, at the American Museum of Natural History’s Kaufmann Theater. The talk was both informative and inspirational, expanded my perspective on the science of exoplanetology, and left my head spinning with the discovery possibilities that the next decades may have in store. Dr. Fischer covered 6 broad topic areas in her talk: our place in space in time; exoplanet discovery techniques; the importance of finding many Earthlike worlds; how do we know if a planet is “habitable” enough; how our solar system compares with others we’ve found; and astronomy as a vision plan for life on Earth. Debra started with our own solar system, describing the (now) 8 planets and other bodies, and how Earth is the only habitable world among them, and then quickly zoomed out, with the Sun as one of billions of stars in our galaxy, and the Milky Way one of billions of galaxies. “We’re such a tiny speck in a vast universe,” she said. As to our place in time, she evoked Carl Sagan’s cosmic calendar, a measuring stick in which the age of the universe is compressed into a single year, to try to put the time scale of the universe in human terms. In it, the Big Bang occurred as the New Year began, and we’re waiting just as the clock is about to tick over into a new year. In this scenario the Milky Way formed in May, the Sun and its planets in August. The dinosaurs arose on December 25 and went extinct on December 30. All of human history would have taken place in the last hour or so. Fischer marveled at the human ability to study and comprehend the universe around us, and wondered what humanity might be able to accomplish if we were to have the same species longevity as the dinosaurs. Debra then discussed the transit method and the Kepler project, singling out Kepler-11—the 6-planet system whose small worlds were confirmed by transit timing variations: some of the transits appeared earlier or later than expected, enabling the Kepler team to calculate the mass of the planets based on their effect on each other. She also discussed “Tatooine,” the Saturn-sized world orbiting a double star. She, Meg Schwamb, and others at Yale got in touch with Chris Lintott and the Oxford team running the Zooniverse, and the result is the Planet Hunters site, with which she notes the public has found exoplanets that “…fell through the cracks in the Kepler data.” Our work here has also helped the Kepler project fine-tune its search algorithms. Projects like Kepler and HARPS have been detecting smaller, rocky worlds, some in or near their star’s habitable zone. In order to eventually find life-bearing worlds, it’s important that we find a large sample of potentially habitable worlds. “We want to find hundreds of Earths,” she said. Debra is in charge of a project that uses CHIRON, a spectrometer her team developed, to search for low-mass, rocky planets around Alpha Centauri A and B, the nearest star system to Earth. If planets are found there, she thinks that eventually humans will send space probes there—not spaceships filled with humans, but nanotechnology-inspired micro-ships more like cell phones, which can take pictures and “phone home”. We’ve found hundreds of planets, thousands of candidates. Most of the planets are multiple-planet systems. How many of the systems look like ours? Statistical analysis of Kepler data indicates that there are ~1.6 planets per star (a lower limit). Around 1% of stars will have hot Jupiters, and that occurrence rate goes up if the star has more heavy elements and if the star is bigger. For Earths and super-Earths, occurrence rate is greater than 30 percent, probably 45 or 50 percent. Also, planets are prone to migrate away from the location they formed, just as 51 Peg B migrated in to a 4-day orbit. Theoreticians are convinced that planets move around all the time. In fact, there’s evidence that asteroids and comets scattered in a configuration that only makes sense if Uranus and Neptune were once between Jupiter and Saturn, and then went spiraling outward into wider orbits.